Talking to my customers, everybody is asking about the Internet of Things. There is so much information about the IoT, that it can be confusing to figure out how to solve your specific business problem with all the options available. Where the rubber meets the road is putting hardware, software, and services together to get to a cogent solution. All while reducing costs and time to market, of course. So when I heard someone wanting to connect to Bug Labs’ dweet.io I was intrigued. Here’s a service that claims to make the sending of data very easy. I don’t even have to sign up for a free account, I can just start sending data from my device? Let’s try this out. 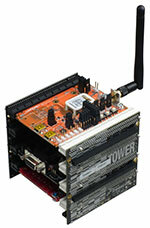 I took a Lantronix xPico Wi-Fi Freescale Tower System connected with a Kinetis microcontroller. The xPico Wi-Fi manages the TCP connection to the dweet.io server, so the microcontroller only needs to construct the message to be sent. The dweet.io platform accepts data with standard HTTP requests, so the microcontroller just sends the following data to the UART port, and the rest is taken care of by the xPico Wi-Fi. There are many services and products to help get your device connected to the Cloud. Lantronix hardware and the software applications that run on it make it very easy to connect your device to the network. The dweet.io and freeboard.io services from Bug Labs can take the data from the device and make it actionable quickly. Figuring out how to use the Internet of Things to your advantage doesn’t have to be complicated. We can help you design and implement a total solution of hardware, software, and services to meet your needs.